Recently I have been feeling a "general sense of tiredness". Sometimes headaches and maybe occasionally the "stoned/dizzy" feeling. Also, my right eye recently also started to be more sentitive to bright light and can get slightly blurry in bright environments. So on Wednesday evening, I decided to go see a GP to check out what is wrong. 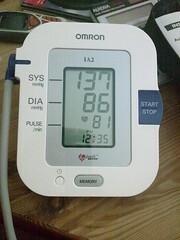 After checking several things, the main conclusion is that my BP is high. The first reading gave him a shock, 155 mm/Hg for Systolic! The second reading went down to 145 mm/Hg. In any case, I already had this suspicion about my BP because of the recent stresses at work and the lack of sleep/rest. Today is my 2nd day of MC and I decided to get myself a BP monitor so that I can monitor BP myself. There were several models but eventually I settled on the mid-range model which has most of the features I need. Cost about 150 bucks. I have taken several readings already. Some are normal and some are above 135/85 (which is supposedly the guideline for being borderline hypertensive). As you can see from the pic, this is in a normal relaxed setting at home and my BP is still borderline hypertensive (137/86). Can't imaging what would be like in the office! Tuesday I took child care leave and brought Cayden to NUH for his second round of vaccination. 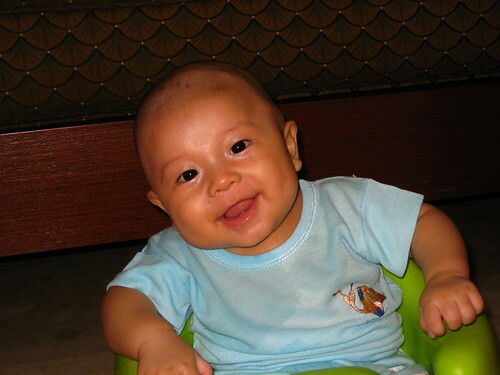 The pediatrician seemed to be pleased with "little botak's" physical development. His comments were that he was about 2 months ahead. (i.e. He can now turn over, interact through voice, grab stuff and even stand supported for a few seconds). Obviously mummy and daddy were very happy to hear this. Anyway, the vaccinations this time round included 1 oral (Rotavirus) and 2 injections (Pneumococcal and the 5-in-1). There was screaming but it was short. After that, we brought him to Takashimaya to accompany us while we went to convert our broadband, home phone and wifeys' mobile phone to MIO plan. The process was so complicated that it took almost 2 hours! What came out of it was that I got a Nokia N78 (with the S$100 discount) for S$38 only. The N78 is quite an amazing phone packed full of features and it was on offer for just S$138 with a price plan. Its got the works ... 3 megapixel Carl Zeiss with AF and LED flash, 3G, Quad Band, WiFi, A-GPS, Bluetooth, stereo speakers, FM radio, Internet Radio etc. etc. Tested out all these features and they worked like a charm. Only thing is the GPS took quite some time to lock on to the Satellites (even with the A-GPS). Unfortunately, my office "officially" does not allow the use of camera phones, so this N78 will either be a weekend phone or it will be used "discreetly" since I have an "offical" non-camera E51. Oh yes, we also managed to finish a nice dinner at the Japanese restaurant at Takashimaya B2 today without any problems with the boy too! The boy's head was shaven on Monday ... looked like he didn't mind a bit! In fact, his hair is back with a vengeance. It's Friday today and the stubbly regrowth is now quite obvious. The (last) weekend was not a good one. After the last blog post, got sick with a bad headache and fever. This went on for 2 days until end of Saturday. Then after that, the home desktop PC's graphic card died. Arrgh! As if that was not enough, during Sunday's lunch, as I was chomping down some salad, one part of my molar (yes, my tooth) broke off! Now, I'm about 90% recovered (still got a bit of headache whenever I'm at work but no fever), got a new entry-level nVidia 9500GT graphics card (cost me 139 bucks), but have yet to fix my tooth. Made an appointment for next Tuesday. Hope they are able to rebuild the broken part of the crown. Anyway, it's probably gonna cost a few hundred bucks and some pain too. Other than work, the day ended pretty well when our partner hosted us to drinks (wanted to go to Buddha Bar but it was closed for renovation) at Bar 44 (located on the 44th floor of the Grosvenor House Hotel). Had a "Blackberry Mohito" which tasted a bit like a mix of Ribena and a normal Mohito. 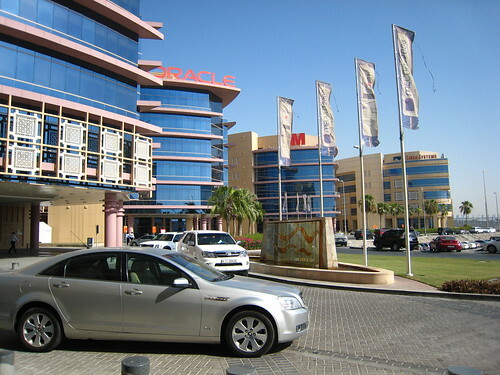 This is Dubai Internet City, where we had our meetings. Not much happening on this day. After work, took a stroll around the apartments where we stayed (Jermeirah Beach Residences - also known as JBR). Bought some clothes for Baby Cayden. After that we ordered Papa Joe's Pizza to eat in. Today was very rush. After work, we went to Ibn Battutah for some very late lunch. It was kind of a disaster; 1. No Taxis ... 2. No Food cos its Ramadan month. In the end, we managed to find some take-away food at the food court (some subway type sandwiches) after 20 mins of walking. After that, we had to walk 20 mins again back to the taxi stand! The mall was huge but empty cos most people were fasting. Since taxis were so hard to find at this time of day, we took the cab from the mall back to the apartments and asked him to wait for us for 10 minutes to "get our luggage" ... which to us meant packing + eating lunch + changing! Anyway, other than the fact that I had to work, it is a nice first trip to Dubai. This is the view from our apartment. 1. The door key can fit the lock but cannot turn (I was afraid of turning too hard and the key breaks), meaning we are stuck outside the apartment with all our luggage. 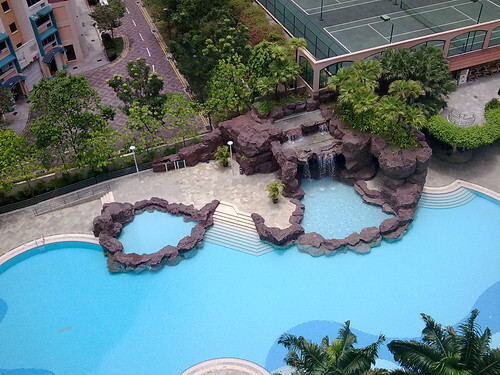 Made a few calls back to Singapore to the last person who used the apartment. Finally, 20 minutes later, I was able to turn the key forcefully. The key could not turn easily because there was another key stuck in the keyhole on the other side of the door. 3. I also discovered that the water heater for the apartment is not working. Will have to bathe in ice cold water for the next few days. Anyway, one of my colleague who is here had a bad fall on Sunday and is now hobbling around. Hope she gets well soon. Let's see what other interesting things happen over the next few days. Forgot to mention that we also visited Mall of the Emirates today.